The saying ‘one step forwards and two steps back’ seems to be the theme for this week’s WIP post! To be fair, some progress has been made but if I’d not had to do any frogging then I’d probably have a finished object by now! The Lush cardigan had to be frogged back to the lace as I realised it really didn’t allow for any growing room and would probably have been a real squeeze to button up. I did some fiddling with numbers and added in some balanced increases to give an additional 2 inches of fabric. 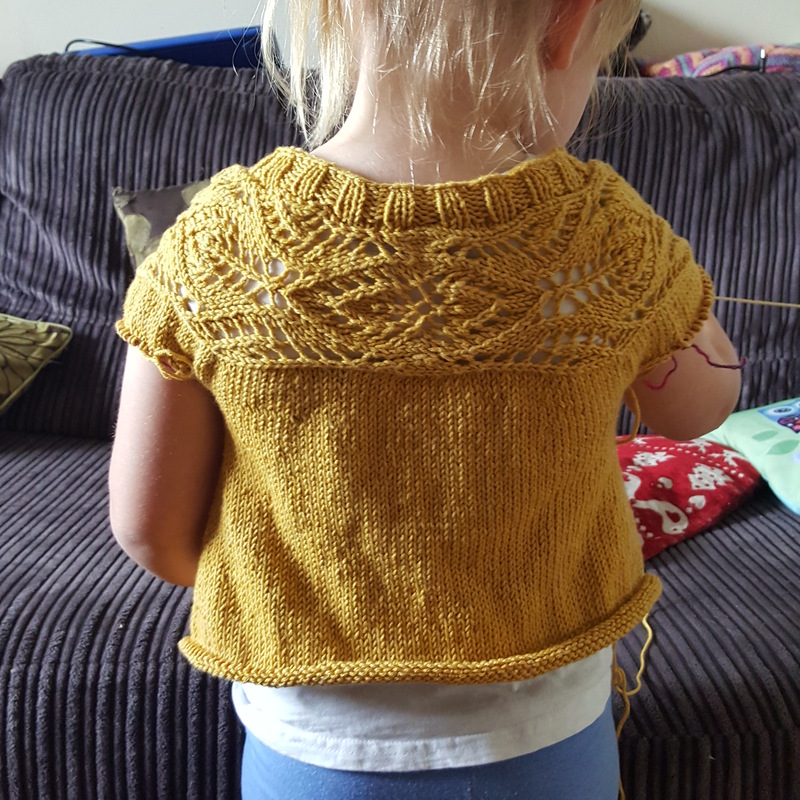 It was a bit frustrating having to re knit so many rows but it will be worth it if the cardigan fits her for a decent amount of time. Since I took this photo I’ve completed the stocking stitch and started the ribbing, so I will soon be on to the sleeves. The yarn I ordered for the lattice squares arrived and so I quickly whipped up all of the lavender ones. I actually had to make 5 as there was a fault in the yarn which meant one square wasn’t quite as nice looking as I’d have liked. I have 4 squares left to make in the shrimp colour and then it’s joining time. Nowhere near a finished object on either WIP yet but I am closer than I was last week! How are your WIPs going? Do you have a favourite thing to work on right now? Please share or tag me on Instagram. Thank you, I hope it’s going to be a lovely autumn cardigan. Fortunately the calculations were fairly simple as it wasn’t a large number of stitches! The cardigan is looking gorgeous. It’ll be so worth it when it’s done! I’ve finally got a bit of mojo for my cardigan again. Cast off the neckline yesterday and picked up the button band today. Not looking forward to buttonholes, but after that it’s just the sleeves to go! Woop! Again the lattice blocks! I can’t wait to see the finished product for those! Thank you, hoping I can join them neatly and choose a perfect border. Frogging is useful, though annoying. Good choice! Better to frog than to create something that doesn’t satisfy. That’s a good point. If only I made the decision at the point of spotting the mistake rather than a few rows later! I’m loving the cardigan. I usually end up frogging and starting over when I have a problem knitting because I haven’t done enough to be good at picking the stitches back up after frogging. That’s probably why I do more crochet projects? I’ve never heard of it, but I will look into it. Maybe I’ll tackle more knitting projects if I didn’t have to restart a project whenever I made an error. Thanks for the info! I watched a video, and it makes so much sense, I’m not sure why I hadn’t heard of it before! I’ll definitely try it, I’m pretty sure it will save me a lot of aggravation! The cardigan (+ the model 😊) are beautiful. I bet she can’t wait to wear it. Thank you. It seems to take forever to make all of the squares for a blanket! My husband made the blocking board, we plan on making more and hopefully selling on etsy, but not just yet. The tools for making them accurately have all arrived now 😊 I shall post if/when we ever get set up. 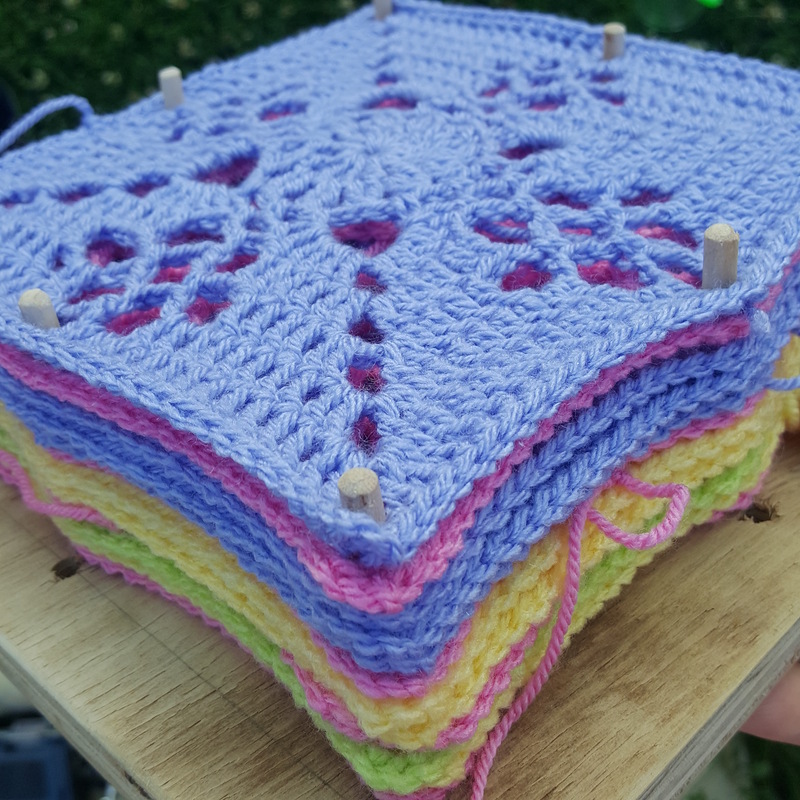 Very pretty squares 🙂 And growing room is certainly useful in a cardigan! Thank you, growing room is essential and I have a 3 year old who needs age 4 really for height and chest, but the next size up cardigan is way too big, hence the number jiggling! The cardigan is looking great, shame you had to redo so much, but it should get plenty of wear and lots of good comments when done. Thank you, I’m hoping it will last her a year! Your munchkin looks adorable in the cardigan. Love the color too! Thank you 😊 Mustard goes with so many other colours. It’s looking really good! 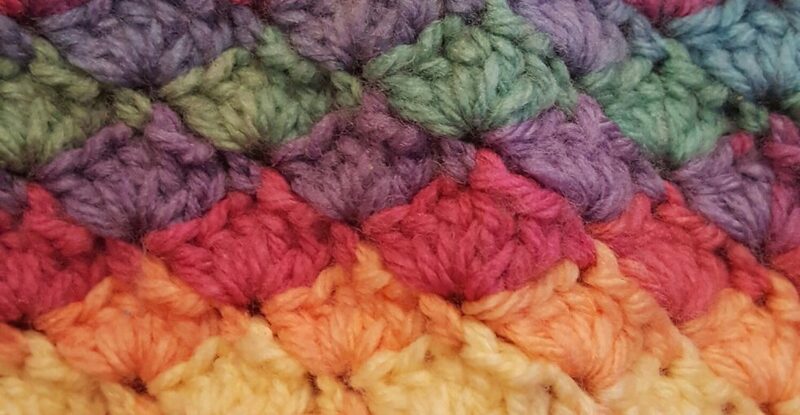 The squares are beautiful too, they’ll make such a pretty blanket. Thank you, I’m hoping my planned layout looks nice! I love the cardigan as it is – without sleeves! I keep thinking that too, I want it to take her through autumn and winter though so I think I will need to add them. It’s a great idea for a future project, the summer version! Thank you, it’s hard once you’ve go e past frogging point, plan b sounds good too! Lots of work you have done, and I so know the feeling of undoing things back that way, but you have done an Excellent job Mrs C and its looking great.. 🙂 and I am loving the shades of your squares.. How on earth you manage it all still amazes me.. Thanks, better to do it now I guess than later on.